Over 500 people who receive TidBITS in email each week responded to our appeal, either renewing an expired membership or joining the TidBITS membership program for the first time. That includes four extremely generous readers who donated at the $1000 TidBITS Angel level. A few people even kicked in extra money on top of their existing membership, something we handle manually via PayPal now but hope to add to the site shortly. Tonya and I, our employees Josh Centers and Lauri Reinhardt, and all our authors appreciate your support! For those who enjoy reading TidBITS but are not currently members, we hope you’ll subsidize our work as well. Regardless, you can thank the nearly 2800 other readers who have made it possible for us to keep bringing TidBITS to you for free. 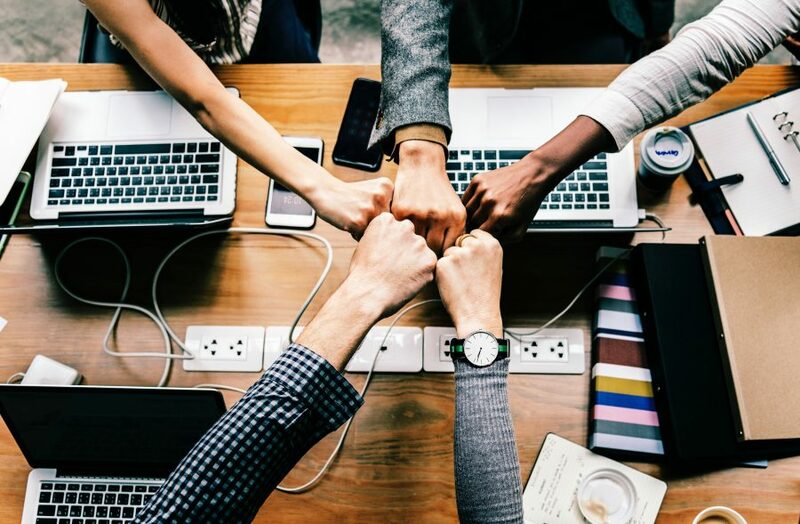 If you are a member, you can access the discounts we provide on over 80 Mac apps by logging in to our site and visiting the Membership Benefits page—it changes dynamically for logged-in members to provide coupon codes and discount links. 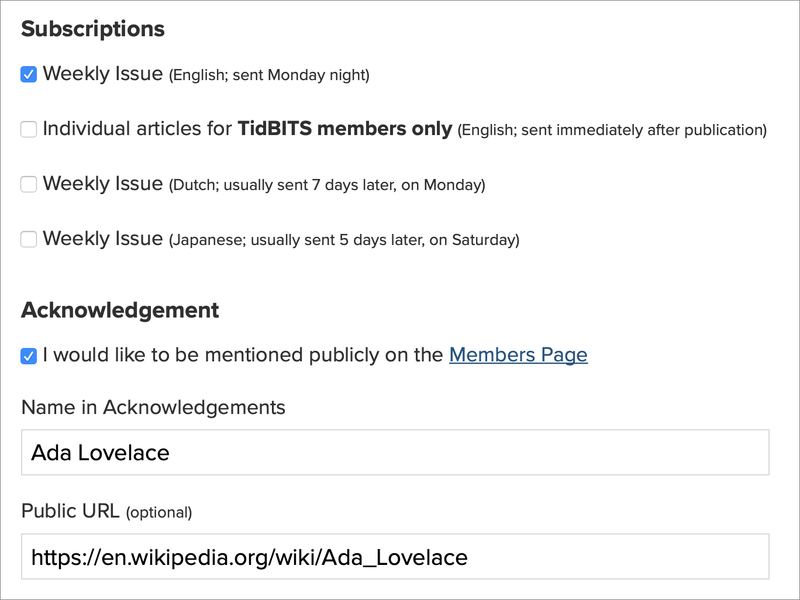 Also remember that you can control whether or not you appear on the TidBITS Members page, along with the name and link that display there, on your Profile page. To do that, log in to the TidBITS site, click the Account link, and on your Account page, click Edit Profile. Scroll down to the Acknowledgement section; also note the Subscriptions section. Thanks again for enabling us to continue bringing you our brand of professional but non-corporate technical journalism! Comments About TidBITS Membership Appeal Successful—Thank You, Members! Well done Adam & Tonya. Good to hear! Thanks, Tommy. This was a true lifesaver. Tonya ran the numbers from December, which is historically our largest month due to that being when we started the membership program back in 2011, and she realized that we were really low. I was going to put an article in TidBITS, but it felt like it would be saying the same thing as what I’d said in December so I decided to try the direct email approach. It’s not something we plan to do regularly, but it was a huge win this time. Infrastructure transitions are hard! This one will probably take a full year to settle down. I never liked eSellerate. They made it difficult to complete some of my early attempts to purchase software. I liked Kagi, with whom I had early success, but they, too, seem to have gone the way of the DoDo. Now, apparently, eSellerate has fallen to the competition. This may have meant headaches for TidBITS, but to my mind it’s no loss. I wish you well with your new provider. Though the switch was not without stumbles, as the Bard said, all’s well that ends well. eSellerate was purchased by Digital River many years ago, and has been running in maintenance mode for ages. We were actually surprised it lasted as long as it did. The venerable digital commerce company Kagi, which has been providing payment processing and shopping cart services to Mac developers since 1994, has ceased operations after an unsuccessful attempt to work off debt incurred by supplier fraud. Our current system relies on the Paid Memberships Pro plugin for WordPress and the Stripe payment processing service, and we hope it lasts for a good long time! When even Sears is on the brink, who can hope to last a “good long time”? I guess Sears did last, a century or more, but things move fast these days. Let’s hope Apple itself lasts as long as Sears did (not likely).